We have adopted Jun-Ri-Soku-Yu (順理則裕) as our basic philosophy. Here junri indicates not only "thinking and acting rationally and logically," but also expresses the idea that "reason and ethics form one's basic attitude as a human being, and ethical values must be respected." This motto was a personal maxim of our founder, the Meiji Era industrialist Eiichi Shibusawa, and has been handed down as our company's management philosophy unchanged to the present day. We here at the Toyobo Group contribute to the realization of a sustainable society through the provision of products and services that will create an affluent future. Also, in order to continue being a corporation that people trust, we will act with high ethical standards and social common sense based on the following ten principles. We will contribute to sustainable economic growth and the resolution of social issues by developing and providing products and services that will create a safe and affluent future. We will maintain a sound relationship with society, including our customers and business partners, by engaging in fair competition and transactions, and responsible procurement. We will carry out fair and appropriate information disclosure and enhance corporate value through communication with our stakeholders. We will conduct business activities that respect the human rights of all persons. We will strive to ensure the quality and safety of our products and services and earn the trust and satisfaction of customers and consumers. We will respect employee diversity and support work practices that allow employees to demonstrate their individual skills. Also, we will provide workplaces that are conducive to productive work while taking health and safety into consideration. We will strive to improve energy conservation and reduce/recycle the resources used by our business, and move forward with the development of products and technologies that contribute to reducing the burden on the environment. We will actively participate in society and contribute to its development. We will conduct thorough crisis management in the face of actions by antisocial forces, terrorism, cyber attacks, natural disasters and other crises that pose a threat to corporate activity. The management, operating under the spirit of this Charter, shall strive to resolve issues while working together with the entire Group. The management should also encourage behavior based on the principles of this Charter within the Group's supply chain. In the event that the Group violates the spirit of this Charter and loses the trust of society, the management shall proactively take responsibility to respond to the situation, including resolving the problem, investigating the causes, and preventing the problem from recurring. A "category leader" is a business that overwhelmingly dominates in a specific market or field as a result of a company's unique technologies and expertise. Corporate Slogan: "Ideas & Chemistry"
With the advent of our 130th anniversary, we are proud to present our new corporate slogan: Ideas & Chemistry. The technology that we cultivate at Toyobo contributes to the comfort of our daily lives and as such we intend to further focus our technologies on the environment and life sciences fields. Our new slogan resonates with the determination we have to grow to be a category leader, accumulating a variety of technologies that will be useful across a broad range of fields. 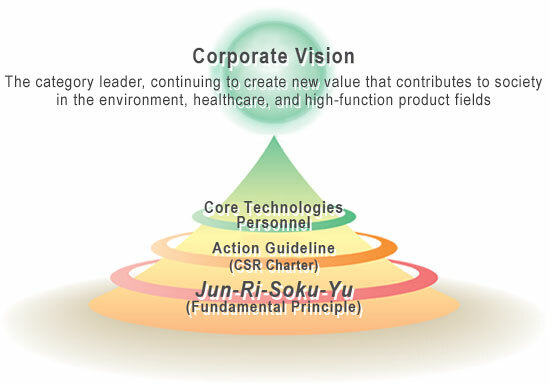 Based on our corporate philosophy, expressed in Japanese as Jun-Ri-Soku-Yu (Adhering to Reason Leads to Prosperity), we are advancing toward a new stage by combining Ideas that lead to high performance with Chemistry to create new materials.